Jerome ‘Slim’ Du Plooy’s life growing up in Kliptown Soweto is a far cry from the successful life he leads now as a sought after TV presenter and MC, however this highly motivated and enthusiastic young man has not forgotten his roots or who he was and how he got to where he is today. ‘I grew up in a one-room house with my mother – we had no electricity or running water. 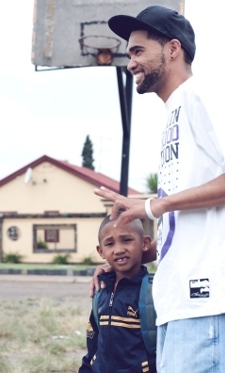 It was tough, but an opportunity through SKY (Soweto Kliptown Youth) changed everything. I met with the NBA in Grade 12 when they saw something in me and made it possible for me to study at Boston Media House,’ says ‘Slim’. Slim says he worked hard, perhaps because he knew he had been given an opportunity and he did not want to disappoint those who had spotted him and recognized his natural talent. Slim says that he knew that Boston City Campus was the best place to go – ‘It had such a good pass rate,’ but adds that it was not easy. The famous words from one of our lecturers, Ruan Venter, echoed through my Boston years; “In the first year, you will wanna be, then you will realise that you are gonna be and finally when you finish in third year you will know that you will be, but to get there you will have to work’. Whilst at Boston he was also encouraged to get involved with community radio to get experience even if it meant working for next to nothing. Slim says this was some of the best advice he was given as it gave him the confidence and experience he needed when he got his break into mainstream broadcasting. ‘One really has to remember that it is not about being a celebrity and all the glamour – being successful whether it be at college or in the working world is about hard work and remaining humble. Keep your feet on the ground. Too many youngsters get caught up in the hype with their heads in the clouds and after a year or two they have dried up and have nothing more to offer,’ warns Slim. Right now, Boston’s Radio Student of the Year for 2009, has got the world at his feet. 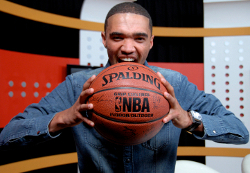 Not only does he present The B-Ball Show, a sports and lifestyle show, on SABC1 but last year Slim also MC’ed some of the biggest NBA events, including the Basketball Without Borders Africa event run in Joburg by the NBA. He then went on to MC at the NBA All Star Weekend in Orlando, US – to an audience of 200 000. 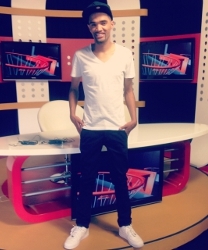 Through his association with Cabby Magongwa of marketing and event management company Darkchild Productions, Slim has also presented the ESPN Celebrity Basketball games. ‘I really love Boston – they prepared me so well and gave me so many opportunities and I hope to be able to give something back in the future – like giving some kids like me that have the potential (but not the means), the chance to attend a great college like Boston. A big part of the NBA is about giving back and I want to do the same,’ he adds. Slim would himself like to return to Boston to pursue something in Sports Management. In this way he can contribute more to the country’s sports administration and make it a sports powerhouse to be reckoned with. For more information contact Boston Media House on 011 883-0933 or please visit www.boston.co.za. Boston Media House can also be contacted in Pretoria Arcadia on (012) 343-1731 or Umhlanga on (031) 561-5629.